I’m lovin’ these desserts for two! It’s such a life saver for anyone living by themselves or with just one other person. Just enough indulgence without going overboard. When a reader requested a carrot cake recipe for two, I was happy to give it a try (or three tries). 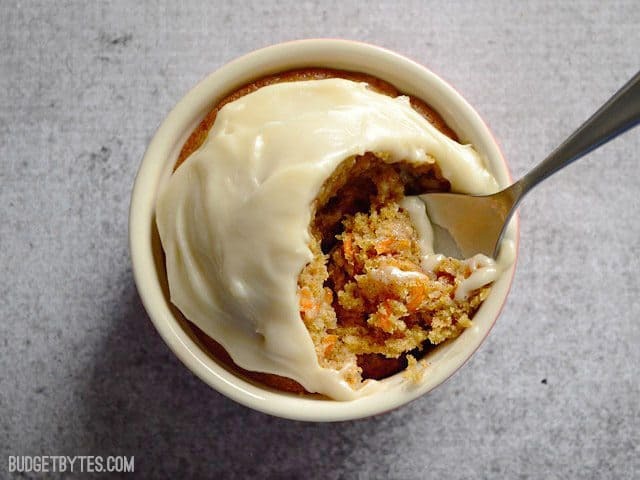 I LOVE carrot cake and I almost always have a partial bag of carrots hanging out in my fridge because I love shredding one or two into different recipes for added nutrients and they stay good for quite some time. 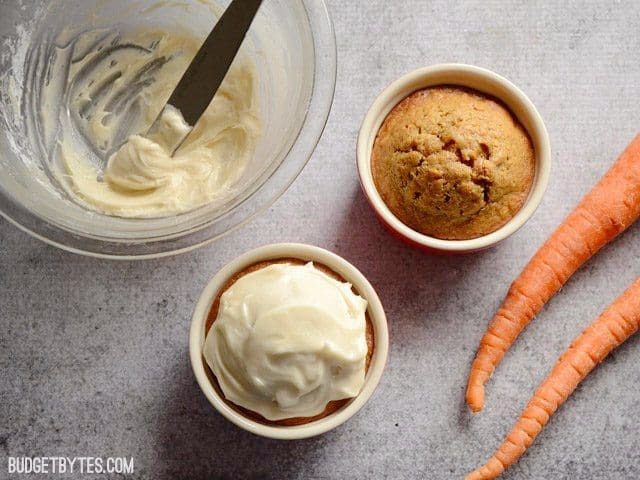 So these little Carrot Cakes for Two are a great way to use up the last one or two carrots in the bag. It took me three tries to get this recipe right, but hey, I’m not complaining. That just means I got to eat carrot cake three times. Tee-hee! I left the recipe pretty simple as just a spiced cake loaded with shredded carrots, but you could always add a few raisins or even some shredded coconut to the mix (stir them into the wet ingredients). Oooh, or walnuts. Yes, walnuts would be good in there too. Yum. 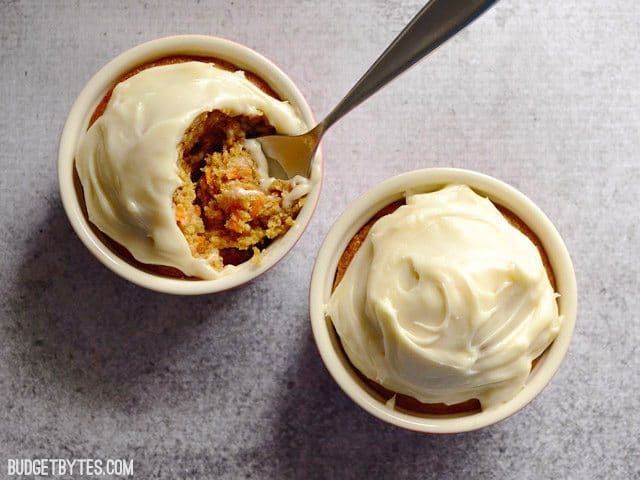 Make just enough carrot cake to make you and a loved one happy. No leftovers to "accidentally" indulge in! Preheat the oven to 350 degrees. 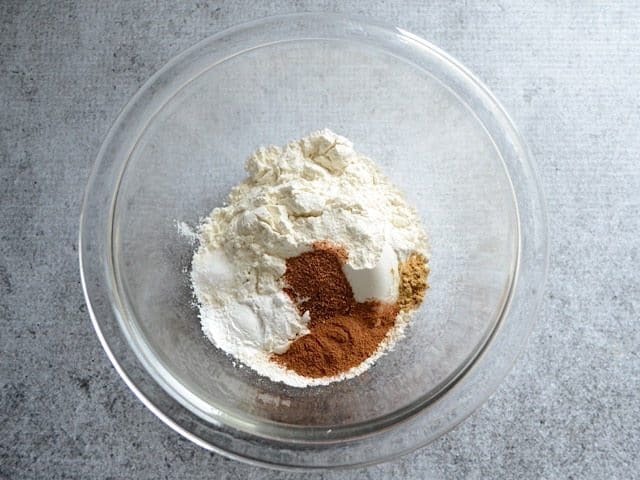 In a medium bowl combine the flour, baking powder, salt, cinnamon, nutmeg, and ginger. Stir until evenly combined. Peel the carrot and use a large holed cheese grater to shred it into a separate bowl. 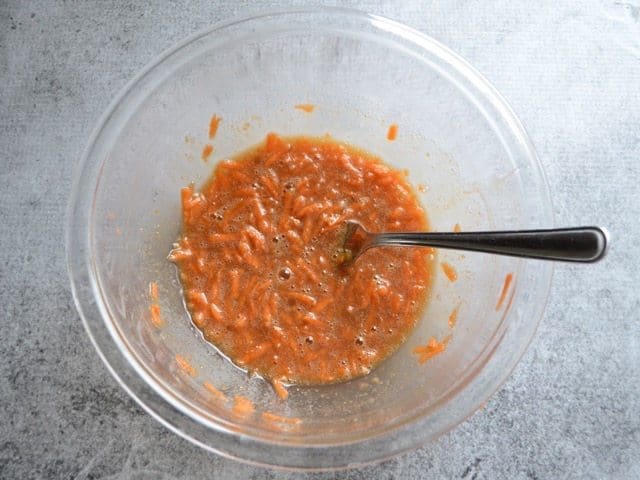 Add the egg yolk, brown sugar, vanilla, and vegetable oil to the shredded carrot. Whisk these ingredients together with a fork until evenly combined. 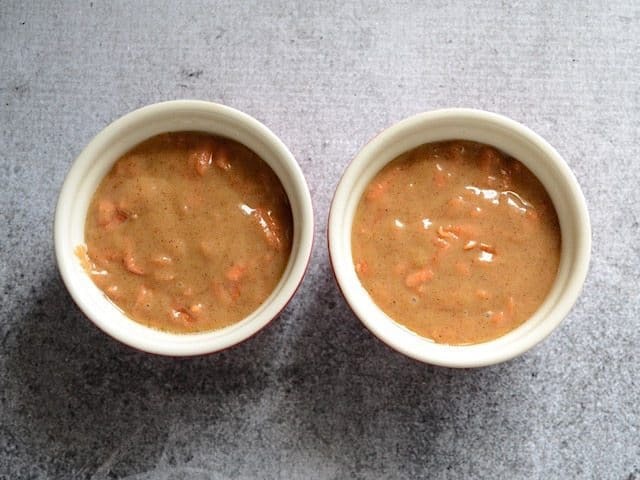 Pour the bowl of dry ingredients into the bowl of wet ingredients and stir just until evenly combined. Coat two small (6oz.) ramekins with non-stick spray, then divide the batter between the two. 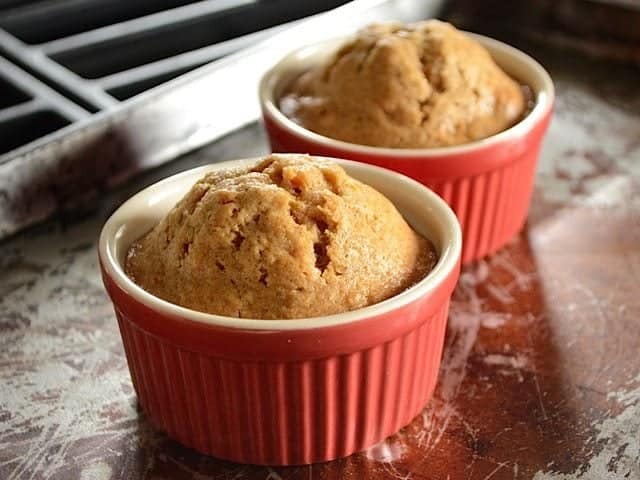 Place the ramekins on a baking sheet to make them easier to transport in and out of the oven. Bake the cakes for 30 minutes, or until a toothpick inserted in the center comes out clean. While the cakes are baking, place the cream cheese, butter, and vanilla extract in a bowl and allow them to come to room temperature. Once room temperature and soft, whisk with a fork until smooth. Stir in the powdered sugar a little at a time until it is all incorporated. Allow the cakes to cool before spreading the cream cheese frosting over top (otherwise it will melt and slide off). Enjoy! If you don't have small ramekins, these can be baked in a muffin tin. Begin by preheating the oven to 350 degrees. 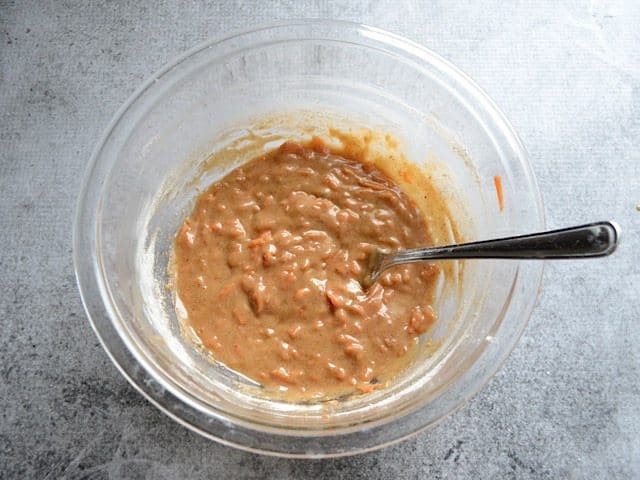 In a medium bowl, stir together 1/3 cup all-purpose flour, 1/2 tsp baking powder, 1/4 tsp salt, 1/2 tsp cinnamon, 1/4 tsp nutmeg, and 1/8 tsp ground ginger (optional). In a separate bowl, combine the yolk of one large egg, 1/4 cup brown sugar, 1/4 tsp vanilla extract, 2 Tbsp vegetable oil, and one medium carrot that has been shredded using a large holed cheese grater. Whisk with a fork until evenly combined. Pour the bowl of dry ingredients into the bowl of wet ingredients and stir just until they are combined and no dry clumps remain. Try to avoid over mixing. Coat two small 6oz. ramekins with non-stick spray (or a muffin tin) and divide the batter between the two. Place the ramekins on a baking sheet to make it easier to move them in and out of the oven. Bake the cakes for 30 minutes, or until a toothpick inserted into the center comes out clean. While the cakes are baking, add 1 oz. 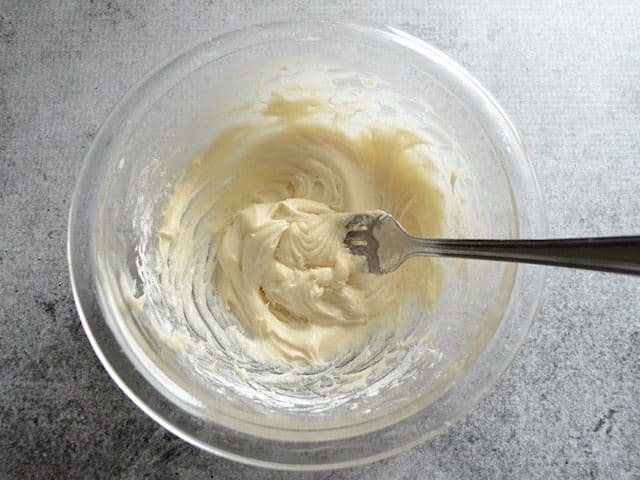 cream cheese, 1 Tbsp butter, and 1/4 tsp vanilla extract to a bowl. Let them come to room temperature, so they are soft and easy to work with. 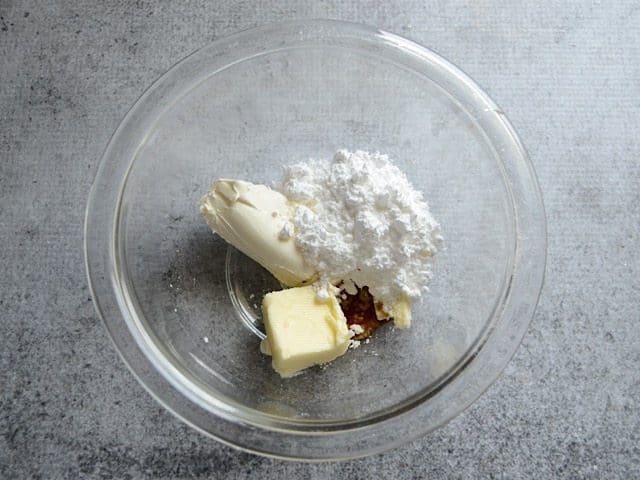 It’s easier to whisk the butter, cream cheese, and vanilla together into a paste before adding the powdered sugar. Once you have the soft paste, add the powdered sugar a little at a time until it’s all incorporated. Ta-da! Now let these cool before adding the icing (or else it will melt and slide off). Once the cakes are no longer hot-hot (a little warm is okay), slather that delicious icing over top. Oh my. Can you assist on what the recipe, bake time, etc to make this into a full 2 tier cake (with icing in between the two layers), so a more traditional style cake? We LOVED making the cake for 2, but now want to make it for the full family. So good. Perfect for a cheat day. I have made this cake twice and it is awesome. Super moist and delicious. I even bought a box grater just to make this cake because I always have a few baby carrots in the back of the fridge. This cake is quickly becoming a favorite in my recipes for two! Lovely. but I baked these in the Microwave. 1 mn 45 seconds on mine. the second time, I didn’t separate the batter, leaving the batter in the bowl that I mixed in (wet ingredients then dry ingredients mixing after each addition. I micro baked for about 2min 15 seconds. And then let sit for about 2 minutes. this saves heating up a whole oven for just a small batch. Light, airy, delicious. And plenty of time to make the glaze while baking and cooling. I am always looking for recipes to adapt for micro baking, and this is one more for my collection. Thank you so much. Oh– I added a few chopped walnuts to the party for a bit of crunch. This was so delicious. Everything about it was perfect! I almost never remember to leave reviews for recipes, but I’ve made this carrot cake three times now in a month and it is pure heaven. I like to cook the batter as a single cake in a 2 cup round glass Pyrex, double the frosting recipe, carefully divide the cake into two layers with a serrated knife, and spread a layer of frosting in the middle as well as around the sides of the cake. My boyfriend was SO sure he didn’t like carrot cake, probably having encountered too many dry and nut/raisin packed versions over the years. 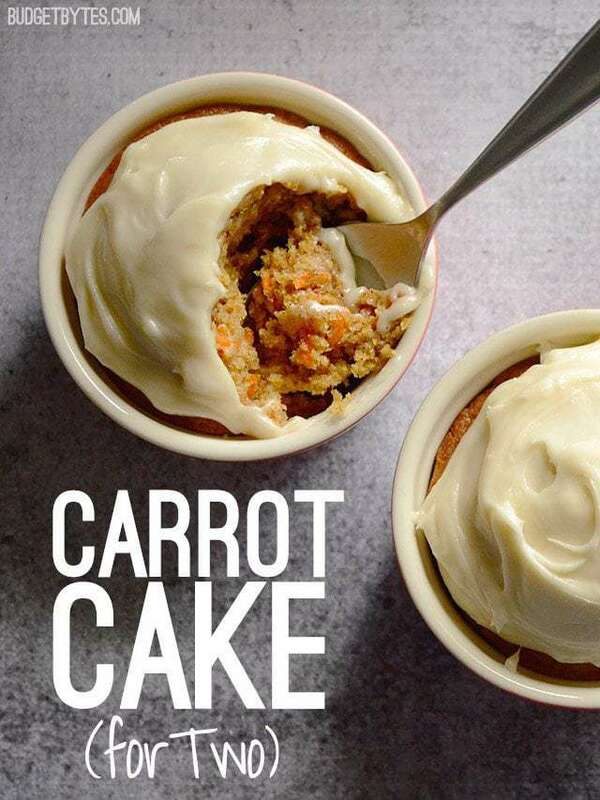 He is now a carrot cake convert thanks to this recipe. It’s so incredibly moist, spiced like Christmas without being over the top, and most importantly, SO easy to throw together at the last minute with ingredients I always have on hand! You could easily fold in nuts or raisins at the last minute if desired, but I think it’s perfect in its pure form. This cake also seems to get somehow better after a day or two in the fridge, if you can make it last that long. Can’t wait to try doubling or tripling it and showing it off during a family vacation in a couple of weeks. I really cannot thank you enough for this recipe.